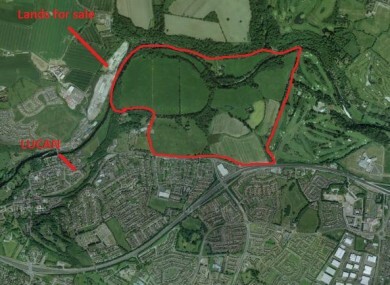 The lands at St Edmundsbury that are for sale. THE DEPARTMENT OF Heritage has dashed any hopes that they would purchase lands along the Liffey Valley. When the 274 acre site goes under the hammer at the Clarion Hotel in Liffey Valley tomorrow, there will be a number of interested parties including local activists, who are hoping that the land will be used as part of a Liffey Valley Park. The proposed park would stretch from Islandbrige in Dublin to Straffan in County Kildare. Members of the Liffey Valley Park Alliance have called on the Government to buy the land at St Edmundsbury, just outside Lucan Village, which includes the land and Deville House. However, a spokesperson for the Department of Heritage said that they would not be meeting the €4.2 million asking price. “The Department of Arts, Heritage and the Gaeltacht does not have any available resources to allow for the consideration of the purchase of these lands. Furthermore, the purchasing of these lands would not fall under the remit of the Department of Arts, Heritage and the Gaeltacht and would be a local authority matter,” said a statement from Jimmy Deenihan’s department. South Dublin County Council also said that they could not afford this, or any, large portion of land. South Dublin County Council does not have resources available to enter into negotiations for significant land acquisition at this time. “NAMA cannot discuss the position around individual assets or debtors. However, contrary to what many believe, NAMA does not have the power to donate assets to what it, or others, feel are deserving causes. “The agency doesn’t actually own the assets which are held as security against the loans which it holds – in the same way that a bank doesn’t own a house which it holds as security on a person’s residential mortgage. “If NAMA doesn’t recover the outstanding loan and has given away the asset linked to that loan then the taxpayer will be at a loss. Taoiseach Enda Kenny has previously visited the site and said that the park would have positive impact on tourism for the four areas which the park would be in- Dublin City, South Dublin Kildare, Fingal and Kildare. Campaigners have called the chance to buy the land a “once in a lifetime opportunity”. The land will be sold in three lots, a 268-acre parcel, the house and six acres, or altogether. There are farm buildings and a gate lodge on the land, though development is unlikely. It is zoned under a Special Amenity Area Order protecting the Liffey Valley. Email “Government has no plans to buy 274 acre Liffey Valley site”. Feedback on “Government has no plans to buy 274 acre Liffey Valley site”.